Be the first to share your favorite memory, photo or story of Frances . This memorial page is dedicated for family, friends and future generations to celebrate the life of their loved one. 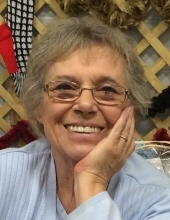 Frances “Franki” Durbin, 79, of Hopkinsville died at 12:22 p.m. Monday, March 25, 2019 at Gallatin Health Care Center in Gallatin, TN. Funeral Mass will be 12:00 p.m. Monday, April 1, 2019 at Saints Peter & Paul Catholic Church. Burial will follow in Kentucky Veterans Cemetery West. Visitation will be Sunday from 4:00 – 7:00 p.m. with a Rosary at 7:00 p.m. Hughart, Beard & Giles Funeral Home is in charge of the arrangements. A native of Orpington, England she was born October 28, 1939 the daughter of the late William Gerard Ryan and Majorie Horner Ryan. She was retired as the Director of Religious Education at Saints Peter & Paul Catholic Church and was a homemaker. She was a member of Saints Peter & Paul Catholic Church where she served on as a Eucharistic Minister, member of the Bereavement Committee, and volunteered at St. Vincent DePaul. She also volunteered for the Hopkinsville – Christian County Public Library. She was preceded in death by her husband: Cecil Eugene “Gene” Durbin; and her brother: Desmond Ryan. Survivors include her children: Matthew Durbin of Bowling Green, KY, Nicki (Chet) Durbin Marmoll of Marietta, GA, Liam (Susan) Durbin of Columbus, OH, Jennie (Chuck) Durbin Sweat of Hendersonville, TN, Ben (Ellen) Durbin of Cedar Park, TX, Tim (Dawn Broadley) Durbin of Stornoway, Scotland, and Pippa Durbin of Waltham, MA; her brother: Will (Janet) Ryan of England; her sisters: Kath (John) Manthorpe and Brenda (Geoff) Ford both of England; her sister in law: Lyn Ryan of England; and 19 grandchildren. Memorial contributions are suggested to the Saints Peter & Paul Catholic Church RCIA or the American Cancer Society. To plant a tree in memory of Frances "Franki" Durbin, please visit our Tribute Store. "Email Address" would like to share the life celebration of Frances "Franki" Durbin. Click on the "link" to go to share a favorite memory or leave a condolence message for the family.